Want The Kindle Source Code? You Can Have It. So this isn’t new, it’s actually been available since late 2007 as far as I can tell, but enough people are tweeting about it today, that’s it’s worth mentioning again. Amazon has a page where you can download the Kindle’s source code. 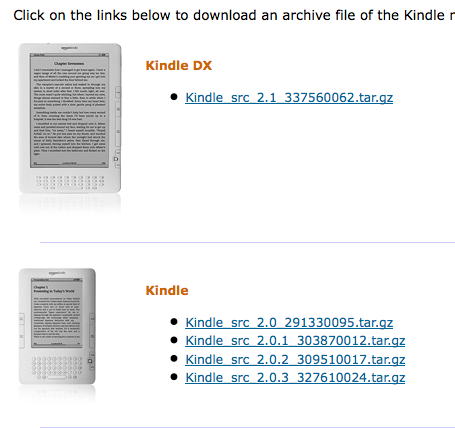 What is new today is that the Kindle DX, its new larger reader, has also been added to the mix of downloadable code. And you can also download the code to all the previous firmware version of both the first and second generation Kindles. AMAZON AND ITS AFFILIATES PROVIDE THE SOURCE CODE TO YOU ON AN “AS IS” BASIS WITHOUT REPRESENTATIONS OR WARRANTIES OF ANY KIND. YOU EXPRESSLY AGREE THAT YOUR USE OF THE SOURCE CODE IS AT YOUR SOLE RISK. TO THE FULL EXTENT PERMISSIBLE BY APPLICABLE LAW, AMAZON AND ITS AFFILIATES DISCLAIM ALL WARRANTIES, EXPRESS OR IMPLIED, INCLUDING, BUT NOT LIMITED TO, IMPLIED WARRANTIES OF MERCHANTABILITY AND FITNESS FOR A PARTICULAR PURPOSE. AMAZON AND ITS AFFILIATES WILL NOT BE LIABLE FOR ANY DAMAGES OF ANY KIND ARISING FROM THE USE OF THE SOURCE CODE, INCLUDING, BUT NOT LIMITED TO DIRECT, INDIRECT, INCIDENTAL, PUNITIVE, AND CONSEQUENTIAL DAMAGES. But if that doesn’t scare you away, go for it. I’m not really sure what anyone has done or is doing with it, but it’s cool that Amazon has opened it up. This isn’t the source to the Kindle application. It’s just the GPL libraries used to power the Kindle software, along with the patches made by Amazon to those libraries. There’s nothing in the tarball that relates to reading books.